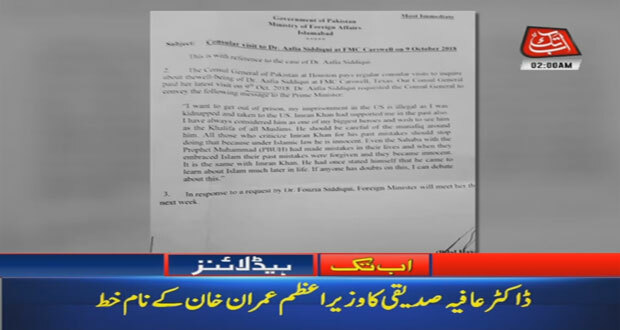 Islamabad (November 07, 2018): Dr Aafia Siddiqui, a Pakistani scientist jailed in the US, on Wednesday requested Prime Minister Imran Khan for her release, diplomatic sources. The Pakistani consul general in Houston paid Aafia a visit on October 9, the sources said, during which she made a request for conveying her message to PM Imran. “I want to get out of prison, my imprisonment in the US is illegal as I was kidnapped and taken to the US, Imran Khan had supported me in the past also. I have always considered him as one of my biggest heroes and wish to see him as the Khalifa of all Muslims. He should be careful of the munafiq around him,” she said. “All those who criticise Imran Khan for his past mistakes should stop doing that because under Islamic law he is innocent. Even the Sahaba with the Prophet Muhammad (PBUH) had made mistakes in their lives and when they embraced Islam their past mistakes were forgiven and they became innocent. It is the same with Imran Khan. He had once stated himself that he came to learn about Islam much later in his life. If anyone has doubts on this, I can debate about this.” Diplomatic sources further said that in response to a request by Aafia’s sister Dr Fouzia Siddiqui, the foreign minister will meet her next week. On June 7, 2018, the Supreme Court of Pakistan summoned a report from the Pakistan Embassy in Washington on Dr Aafia, after a three-member bench, led by Chief Justice Mian Saqib Nisar, heard a petition filed by Dr Fouzia. Dr Aafia was indicted by a New York federal district court in September 2008 on charges of attempted murder and assault, stemming from an incident during an interview with the US authorities in Ghazni, Afghanistan — charges that she denied. She has since been imprisoned in the US.